Starry Nights, presented by International Paper, is a family-friendly holiday experience with drive through and walking trails of lights and displays plus magical Mistletoe Village! Starry Nights is the largest annual fundraiser for the Park, and it’s a holiday tradition for thousands of families. Check out the info below as you plan your visit! Tickets can be purchased at the gate as you enter Starry Nights, or you can save time in line and purchase them online (additional fees may apply)! When you pre-purchase a ticket, you can enter though a separate event entrance, skipping the line at the main entrance! Tickets may also be purchased in advance at the Lake’s Edge Gift Shop. 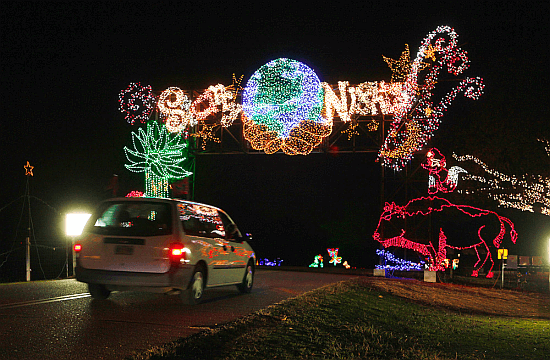 Drive through more than two miles of holiday lights and displays! This year features some new displays, plus some of your old favorites! Tune in to the Starry Radio Station to enjoy holiday music during your drive! Walk the festive half-mile holiday path or ride the Candy Cane Train ($5 per person) to enjoy new light displays along Hyde Lake. Look for the signs in Mistletoe Village to direct you to the holiday path. Located in the Visitor Center, the FedEx Mistletoe Village is your hub for holiday fun! Each night this space will transform into a holiday wonderland, full of activities and winter fun! Mistletoe Village activities are only open during Starry Nights unless noted below. Make a holiday friend at our Build-A-Bear Workshop! All outfits and accessories are sold separately. Pick up an exclusive Shelby Farms Park hoodie (only available at Starry Nights!) for your new friend for $10. Matching hoodies for toddlers, youth and adults are available in the Lake’s Edge Gift Shop! Visit with Santa in his workshop through December 23! Picture packages start at $25. Plus, you can write a letter to Santa and mail it in the North Pole Express mailbox (free)! How do you fit 4,500 acres of fun into a stocking? Visit the Lake’s Edge Gift Shop for exclusive Park gifts! You’ll find something for everyone on your list — from Park gear to Park experience packages to Shelby Farms Perk coffee, jewelry and drink ware…plus more in store! Enjoy a sweet treat during your visit to Starry Nights! Grab some hot chocolate and do a little shopping, and then roast s’mores or marshmallows over a cozy fire pit! Enjoy Starry Nights in a whole new way — on a carriage or on a hayride! Visit Starrycarriagerides.com for more information and to make reservations. Our friends at Big Cypress Lodge are offering a special holiday package that includes passes to Starry Nights! Learn more here.